Noŋgirrŋa Marawili comes from an esteemed artistic family, her father is the famed Yolngu leader Mundukul, who completed crayon drawing for the anthropologist Ronald Berndt in 1947, while her husband is Djutjadjutja Mununggurr and for many years Marawili assisted him with the cross hatching on his bark paintings. 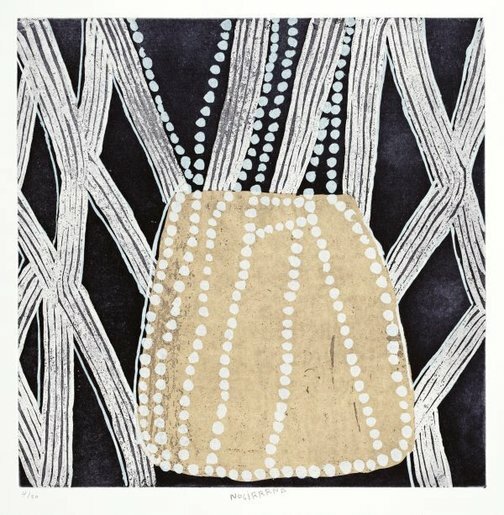 Marawili began her career as a printmaker, but in recent years has further refined her skills in painting to become one of the most unique artists working at Yirrkala today. 'Lightning and the Rock' 2015 depicts the site of Baratjula, which is a Madarrpa clan estate neighboring Cape Shield. As a child, Marawili canoed to this place with her father and family. Her father’s name of Mundukul is also the name of the serpent (a water python, or liasis fuscus) which lives deep beneath the sea here. This design denotes the immensity and depth of this body of water, whilst simultaneously referencing the serpent spitting into the sky and emitting lightning. The lower portion of this print depicts a rock that is firmly situated in the midst of Madarrpa country, with waves breaking and crashing against it. Baratjula is a Madarrpa clan estate adjacent to Cape Shield where the artist visited by canoe with her father and his many wives as a young girl. Her father’s name was Mundukul and this is also the name of the serpent (also known as Water Python, Burrut’tji or Liasis Fuscus) which lives deep beneath the sea here. This design shows the deep water and the ‘curse’ or oath that the snake spits into the sky in the form of lightning from this place. At the base of the image a rock sits firm in the Madarrpa land against which this sea crashes. Signed l.r. corner, pencil "Nogirrrna". Not dated.